The Aztec Empire was a military empire and special emphasis was put on warfare and martial training. The essential working of the empire depended on conquering more city-states and receiving a steady supply of tribute. Every city-state defeated by the Aztecs would pay a certain amount of tribute and retain a fair amount of autonomy in return. Thus warriors were glorified in Aztec society and it was the aim of every young boy to become a warrior when grown up. Due to this reason, basic military training was deemed necessary for every Aztec young boy. Aztecs were always at war with the other city-states since their migration from the north. However, the actual history of Aztec warriors began with the inception of the Aztec Empire in 1428. After the empire was established, basic military training became necessary for all Aztec males. Further, different societies of Aztec warriors were formed and military virtues became very important in the society. Showing feats of achievement on the battleground became one of the sure ways of obtaining upward social mobility. The appearance of Aztec warriors was important in defining their role within the military and even within society. Thus there were common Aztec spear-men whose costume consisted merely of a loincloth. These common warriors fought with spears and used simple shields. Warriors who came from nobility were ranked higher and their appearance depicted the same. For instance, the Jaguar Warriors donned a jaguar like costume while the Eagle Warriors had an eagle costume accordingly. 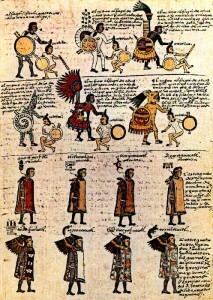 The appearance of Aztec warriors reflected division of the military into different parts. 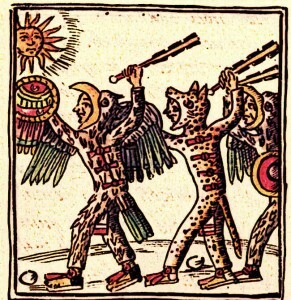 The Aztecs gave basic military training to all young males in Aztec society. Children of the common people were trained in schools called “telpochcalli”. Young boys accompanied their leaders as shield-bearers and performed less important tasks such as making fire or cleaning the house. Various war captains and veteran warriors trained the young boys in warfare including the proper use of weapons and military tactics. Training of children from noble families, on the other hand, was done in separate schools called “calmecac”. They received training in diverse disciplines which included advanced warfare from the seasoned warriors. Aztecs used various fighting methods and displayed their skills on the battleground. In the standard method, the king or general signalled an attack with a drum or a conch-shell trumpet. At front ranks of the advancing army were the expert warriors followed by various other orders. The veterans and the novices were at the rear end. The Aztecs also made very efficient use of intelligence gathering and spies known as “quimichtin”. These spies would visit the enemy territory before the war to gather information about the terrain and compile other important details. Aztec warriors were divided into various ranks or groupings of warriors. Aztec warriors were divided into various ranks or groupings of warriors. The lowest rank usually consisted of the porters who carried various weapons and supplies. This group was derived from the common people. Next came the young men from the common people who had received military training at the “telpochcalli”. Another rank was for commoners who had taken captives. Above these ranks of the common people were various societies of the noble warriors such as the eagle and jaguar societies. These were ranked according to the number of captives they took. The warriors who came from nobility were divided into various societies each having its own distinguishing costume and characteristics. Sometimes, commoners who performed exceptionally well on the battleground were also inducted in these societies. The most important societies were the eagle and jaguar societies. Warriors who performed exceptionally well and captured at least four captives were inducted in these societies. Other Aztec warrior societies included “The Shorn Ones”, “Otomies”, “Papalotl”, and others. The Aztecs almost always sent their spies to the enemy city for intelligence gathering before the battle. These spies were called “quimichtin” and were particularly dispatched to gather such information as the nature of the enemies terrain, fortifications, and the general preparations of the enemy army. One of the responsibilities of the spies was also to find out more about the dissidents in the area and pay them for collaboration and information. The Aztecs also had trade spies known as naualoztomeca who gathered information at the marketplaces. Aztec warriors used different kinds of short and long range weapons. One conventional weapon was the Aztec dart thrower used to shoot small darts called “tlacochtll”. This was considered a weapon of the gods by the Aztecs and was used mainly by the nobility. Another weapon was the Aztec war bow constructed from the tepozan tree and known as “Tlahhuitolli”. Other weapons commonly used by Aztec warriors included the Aztec arrow quiver called “Micomitl”, a blowgun shooting poisoned darts called “Tlacalhuazcuahuitl”, a wooden spear with sharp obsidian blades called “Tepoztopilli”, and others. Aztec warriors used different kinds of shields as part of their armour. For instance, a shield made of wood was called “cuauhchimalli” while the one made from maize cane was known as “otlachimalli”. The nobility used a quilted cotton armour called “Ichcahuipilli” which was soaked in salt water brine and hung to dry so that salt would crystallise. Another important type of Aztec warrior armour was called “Tlahuiztli” which was used by distinguished warriors and members of various warrior societies. Aztec Daily Life Warfare – Aztec warfare and religious ceremonies and rituals were closely connected. Aztec warfare and religious ceremonies and rituals were closely connected. The obvious link between the two was that constant battles and a steady supply of war captives that was needed for human sacrifices performed during the religious festivals. These prisoners were taken to the top of the Great Pyramid in Aztec capital Tenochtitlan and sacrificed by having their hearts cut out. Thus Aztec warriors were central in maintaining the religious and ritualistic identity of the empire. The Aztec Empire was essentially a military empire and thus warriors among the Aztecs enjoyed a very privileged status. There were various warrior societies which were dominated by the nobility but some commoners who performed impressively on the battleground could also be inducted into these societies. Aztecs made use of spies in order to gather information from the enemy territory before the battle. A variety of weapons were used in battle, some of which were exclusively reserved for the nobility.